We are continuing our features on the people of Heartland Marimba. The new artists of the Heartland Marimba Ensemble are the focus, and here we've released an interview with Kansas City native, CHARLES LOVELL. Charles applied this spring to join HME and was offered a contract after a great audition packet. He is completing his doctorate of music degree from the University of Colorado-Boulder. Read below to find out more about Charles. Be sure to also visit his website at https://charleslovellmusic.com/. CL: I am a big coffee nerd! I have a whole collection of different brewing devices - I even have dabbled in roasting my own coffee! I am into anything food related. My wife and I enjoy cooking together. HM: What individual or group of people guided you in your passion for music? CL: I was lucky to have a legendary middle school band director, Gerry Gipson. My parents also supported my musical pursuits by enrolling me in lessons on guitar, piano, and drums at a young age. These experiences helped me find my passion for music. CL: I watched a lot of sports growing up. My parents tell me that my brother taught me the words to “Take Me Out to the Ballgame” before I could even talk! HM: What is your favorite piece to play/perform? CL: The bass drum part in “Rite of Spring” by Stravinsky. I enjoy finding the right mallet and timbre for each section of the piece. The sacrificial dance is epic! HM: What are your career goals? CL: Teach and play percussion. I love playing in orchestras and chamber ensembles. I enjoy teaching students of all ages, but maybe someday I will teach at a college or university. 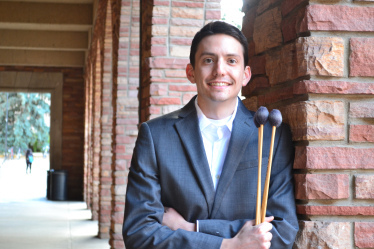 Bio: Charles Lovell is a Doctoral Candidate in Percussion Performance (DMA) at the University of Colorado-Boulder and Percussion Instructor at Blue Valley North High School. Mr. Lovell received a Masters of Music degree in Percussion Performance from Texas Tech University a Bachelor of Music Education degree from the University of Kansas. As an orchestral percussionist, Mr. Lovell studied at the Aspen Music Festival where he performed with the Aspen Festival Orchestra, Aspen Chamber Symphony, Aspen Opera Center, Percussion Ensemble, and the Contemporary Ensemble. He has performed with the Fort Collins Symphony, Boulder Philharmonic, Pro Music Chamber Orchestra of Colorado, Boulder Opera, Cheyenne Symphony Orchestra, Longmont Symphony, Larimer Chorale, Abilene Philharmonic, and Lubbock Chorale. As a marimba soloist, Mr. Lovell performed at the 2018 National Conference on Percussion Pedagogy and in the Semi-Finals of the Graduate Division in the Great Plains International Marimba Competition in Oklahoma City. At CU-Boulder he took 2nd Place in the 2015 Bruce Ekstrand Memorial Graduate Student Performance Competition and was also chosen as a finalist in the CU Honors (Concerto) Competition.